What’s the deal with beet juice? It’s being used as an all natural exercise supplement over recent years, but why? Beet juice is a great pre-workout drink because it’s ability to enhance oxygen flow to the muscles translates to enhanced fuel utilization through aerobic metabolism (which requires oxygen to break down food into energy that can be used by the body). Enhanced fuel utilization may delay feelings of fatigue, as well as lactic acid buildup (the burning sensation often felt during exercise as a result of anaerobic metabolism), which can lead to stronger workouts. Nitrate can be converted to nitrite by bacteria located in saliva via the enzymes called nitrate reductases. Nitrite can then be reduced to nitric oxide (NO) by a variety of enzymes, which remain to be the subject of study (and still remain controversial). NO then enhances vasodilation (widening of blood vessels) through signaling via soluble guanylate cyclase, which ultimately allows for increased blood flow and increased oxygen and nutrient delivery to muscles. It should be noted that the existence of oral bacteria is essential for this conversion to occur, and so the use of antibacterial dental products (such as mouthwash or antibacterial gum) is not recommended directly before consuming nitrate-rich foods and beverages. 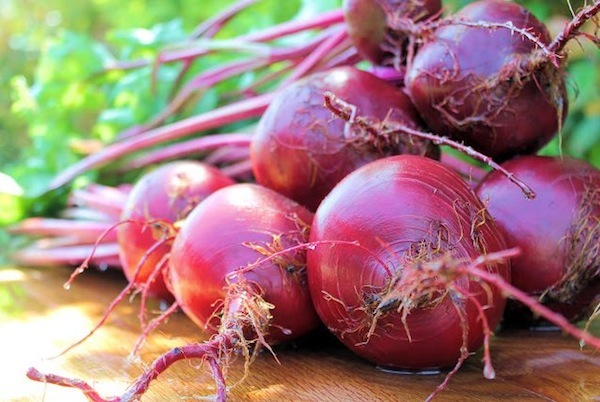 How do beets (and other veggies) get their nitrates? While plants may receive small amounts of nitrates from the air and water, the majority of nitrates are usually delivered to the plant from soil. Specifically, nitrogenous sources in the soil can be converted to ammonia, which can then be converted to nitrates by bacteria. The plant can then absorb the nitrates to use for development and growth. High-nitrogen soils now exist in order to enhance nitrate absorption by the plant. Since the majority of nitrates used by the plant come from the soil, fruits and vegetables that grow in the ground (like beets!) generally contain a higher amount of nitrates. The difference between nitrates in processed meats and those found in fruits and vegetables has to do with other existing compounds in the food. Nitrates can be converted to small amounts of nitrosamines (carcinogenic compounds) in the presence of protein and heat (>300oF). However, fruits and vegetables do not contain the amounts of protein required for this reaction to occur. Additionally, veggies can also be consumed raw, meaning heat is not present, either. Regardless, both protein and heat are required for nitrosamines to form, so nitrates in fruits and veggies are safe. So how do I use beet juice to my benefit? Beet juice is generally used as an ergogenic aid (or an exercise supplement) prior to aerobic exercise (running, biking, etc.). Ideally, beet juice should be consumed about 15-30 minutes before the event (whether it is a race or training). This allows time for vasodilation to occur throughout the beginning of the exercise. Always remember to check regulations of your sport if this is not for recreation, to ensure that beet juice is allowed. Also, remember that consumption of beet juice does not guarantee an improvement in training or time – rather, the literature to date suggests that it may benefit the production of nitric oxide, which in turn could promote vasodilation and may lead to less fatigue during a workout. 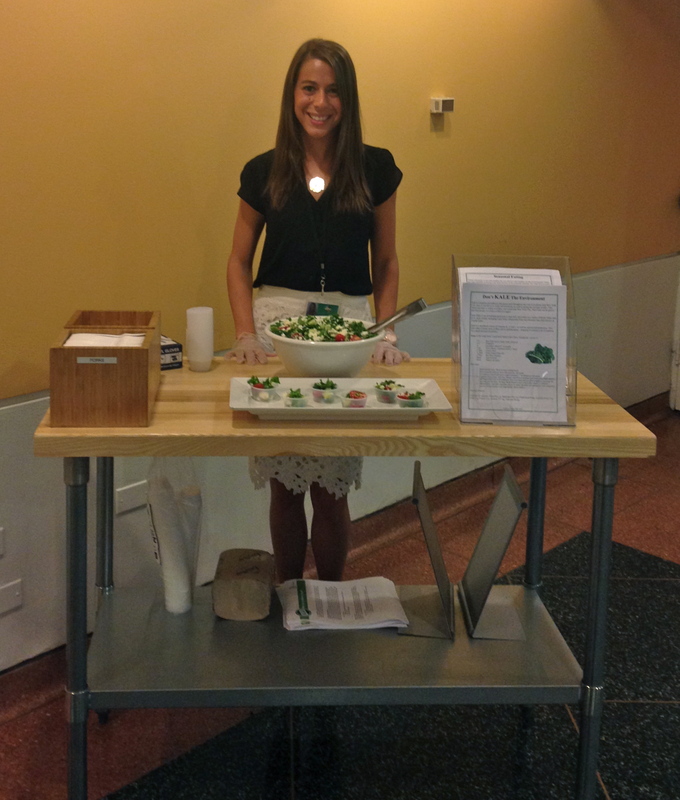 Last week, I developed and promoted a seasonal recipe at Disney ABC as a part of my internship rotation. The recipe was simple, fresh, healthy and most importantly, it was delicious. In fact, it sold out at the company’s cafe that day! While most people were drawn in by the free samples, I got to chat to a number of employees about the benefits of eating seasonally and locally and it was so great to connect with individuals and learn about how other people prioritize nutrition and our environment to promote clean eating (for your body, as well as our home). Serving up some free samples at Disney ABC! You can grow your own! Summer is a great time to grow cucumbers, tomatoes and strawberries! A close-up of the samples! Kale is a nutrition powerhouse that grows well throughout the year in locations near New York City, since it can thrive in cooler environments, as well as during the summer months. This means that kale is widely available year-round near New York City. Since kale can be grown and sold locally, it is truly a GREEN veggie! Kale is a significant source of vitamins K, A and C, as well as calcium and potassium. Also, kale offers a hearty dose of fiber and is nutrient dense – meaning it contains a lot of nutrition for a small amount of calories. 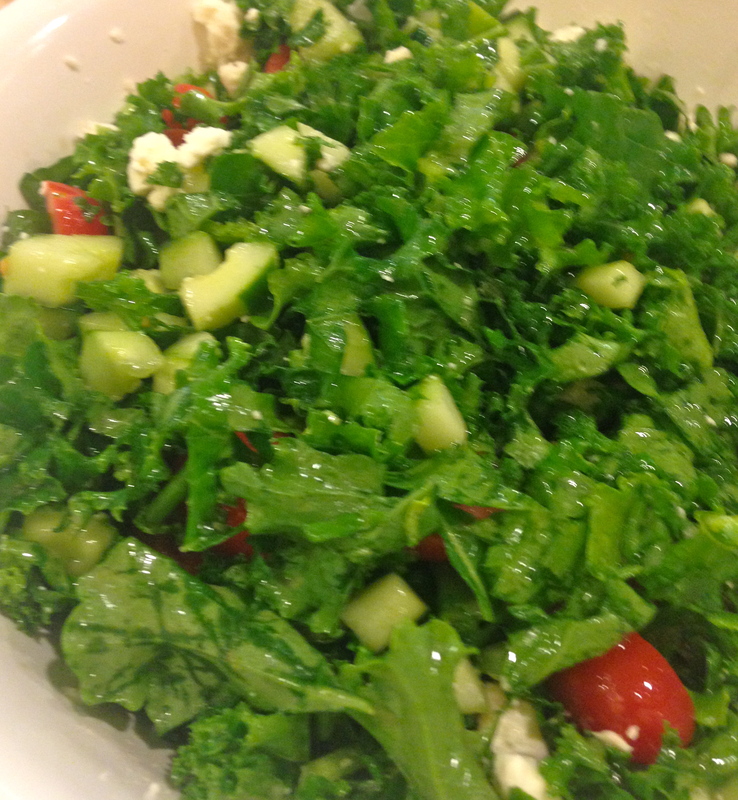 All of the fresh ingredients for this salad (including the kale, tomatoes, cucumbers, feta cheese and lemon juice) were purchased locally – and this salad was a local hit! Wash and dry kale. Place in large mixing bowl. Slice cucumber and cut slices into quarters. Set aside. Cut tomatoes into small pieces (approximately 1” in diameter). Set aside. Combine lemon juice, red wine vinegar and oil in a medium-sized bowl and whisk together until ingredients are well combined. Pour over kale and use gloved hands to massage the dressing into the kale. The kale should begin to look slightly wilted after about 3-5 minutes. Add tomatoes, cucumber and feta cheese to salad. Sprinkle salt and pepper over vegetables and use gloved hands to mix ingredients. Serve chilled. What Else Is In Season Near NYC In The Summer? Below is a list of other fruits and veggies that will be fresh for summer – so have your pickings! GrowNYC. What’s Available. GrowNYC Website. 2015. Available at: http://www.grownyc.org/greenmarket/whatsavailable. Accessed June 8, 2015. I know I’ve given you all a lot of quinoa recipes, but this one is my favorite to date, and is sure to become my new go-to for summer! 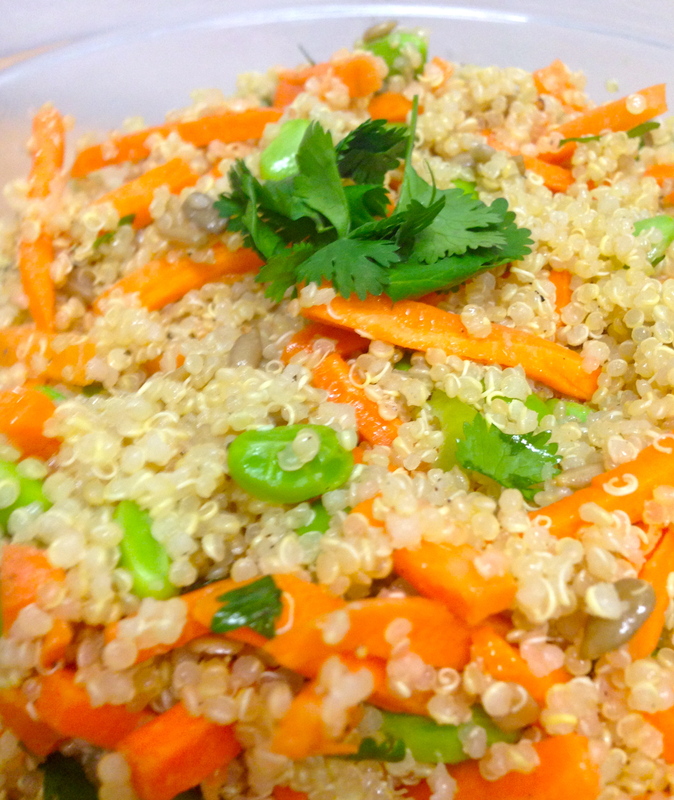 Not only is this chilled quinoa salad refreshing, but it’s hearty in all of the right places (offering a significant amount of protein and fiber) and low in all of the right places, since it is low in total fat, saturated fat, sugar and sodium! Also, this vegetarian dish offers complete protein (i.e. all of the body’s essential amino acids) from quinoa and edamame, so it’s great as a main dish or as a smaller portion as hearty side or snack! 1. Combine quinoa and water in medium-sized pot and bring to a rapid boil, uncovered. Once boiling, reduce to a simmer and cover the pot. Allow quinoa to absorb the water (this should take about 15 minutes). 2. Remove quinoa from heat and allow to cool for a few minutes before transferring into a large mixing bowl. Add edamame, carrots, sunflower seeds, cilantro leaves, salt and pepper. 3. Whisk together lemon juice, red wine vinegar and extra virgin olive oil in a small bowl. Drizzle over quinoa salad and mix all ingredients. Garnish with extra cilantro leaves (if desired) and chill in refrigerator until cold (about 2 hours) if serving that same day. *This dish is great for quick grab-and-go leftovers and keeps well in the fridge for about 5-7 days if sealed in an airtight container!